With consumer spend on Halloween rising every year, it’s hardly surprising the brands are going all all out to capture attention. In fact the UK is expected to increase its Halloween spending by 5 per cent this year to £420 million, according to analysts at Mintel. Halloweek is here – so buckle up for a deluge of ghoulish marketing and PR stunts all hoping to grab some media attention (and some consumer dollar) in the run up to Oct 31. We’ll be adding the best to this round-up. Feel free to send us tips. What if there were a gender wage gap for trick or treaters? The Women’s Foundation conducted a mean but brilliant social experiment. Londoners were given the Halloween heebie-jeebies as a terrifying giant creepy crawly was spotted prowling the streets of the capital. Commuters and tourists experienced arachnophobia as a metre-wide spider was seen scuttling past shops and supermarkets, lurking under bridges and pouncing joggers and cyclists in parks across the city. Hidden cameras recorded reactions, as it was unleashed on the public and jumped out on passers-by. The eight-legged monster prank was staged by drinks brand Fanta. WARNING: LOOK AWAY NOW IF YOU HAVE ARACHNOPHOBIA ? This prank will leave you shaken ? Dating apps are cracking down on ‘ghosting’, (the practice of ignoring a potential partner after speaking to or going on a date with them). Bumble are sending prompts to people who have not replied to messages, urging them to either politely end the conversation or continue it – reports The Telegraph. The dating app are asking users to stop the practice, and to take a “ghosting vow” before they use the app. Every year, engineers at NASA’s Jet Propulsion Laboratory (JPL) in Pasadena, California gather for the ultimate pumpkin carving contest – reports Mashable. Some this year’s creations are out of this world. 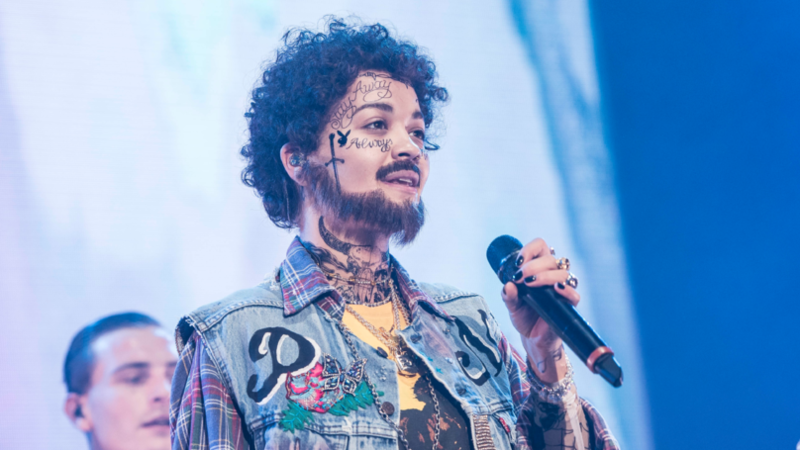 Rita Ora rocked up to the KISS Halloween House Party styled as rapper Post Malone and smashed it. Universal pictures asked digital designers to submit ideas for marketing the new Halloween movie. The five winners got $2,000 and the opportunity to see their artwork included in the movie’s marketing. 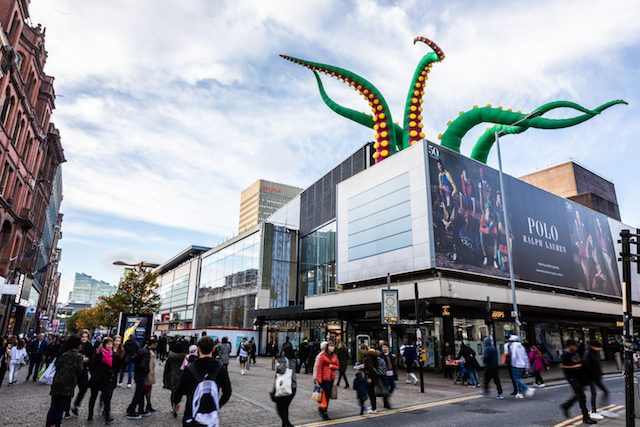 The City of Manchester are promoting whole host of events for all the family and headlining 2018’s event will be a collection of 7 mind-bending inflatable giant monsters. The creations come courtesy of artists Filthy Luker and Pedro Estrellas and are specially created to take over the city’s rooftops and landmark buildings across the capital. Streaming service NOW TV are offering Brits the chance a to hire a free creepy clown bouncer, or “clowncer,” to deter mischief-making trick-or-treaters and guarantee an undisturbed night in watching your favourite scary movie. The Burger giant have revealed a burger that’s green and “clinically proven to cause nightmares” – due to its unique combination of proteins. The Nightmare Burger has been covered by CNBC, Fortune, Fox News, Business Insider and dozens of other outlets in the US. Marmite have released two new limited-edition Halloween jars, available only for a few weeks this October. The temporary jars are to be considered collectables. 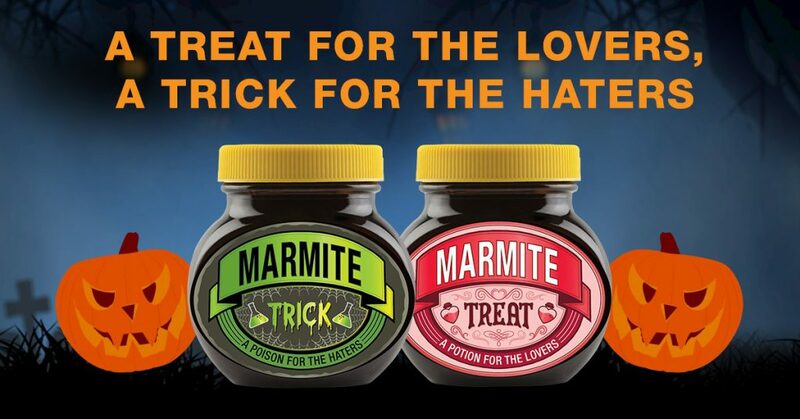 The Spooky Marmite jars come in two variations; A ‘Halloween Trick’ to ‘petrify a marmite hater’ and A ‘Halloween Treat’ to ‘spoil a marmite lover’, both of which can be personalised. 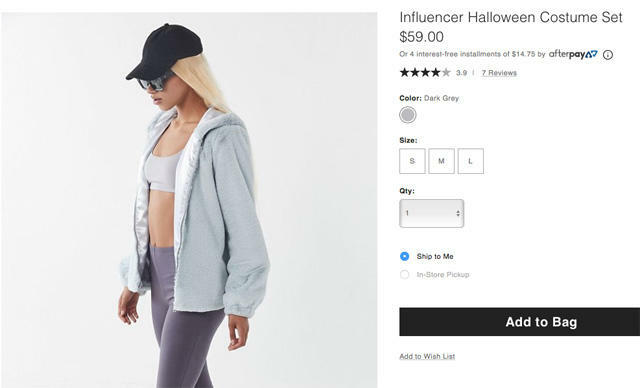 Urban Outfitters are promoting an “influencer costume” – and it comes with just spandex leggings, sports bra and baseball cap. 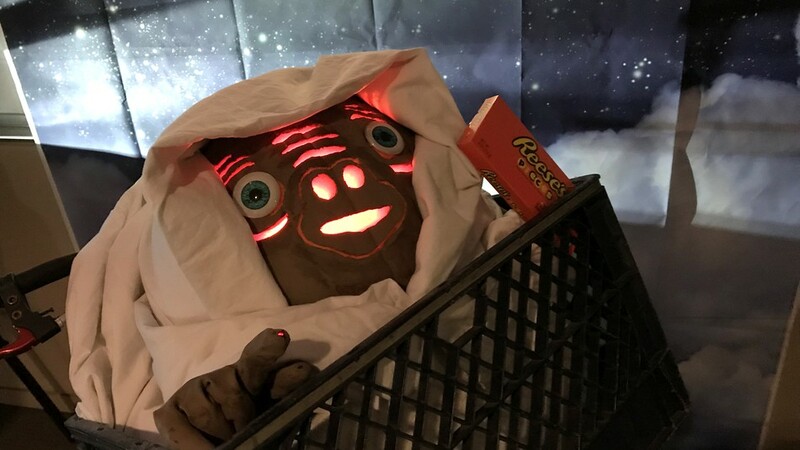 Reece’s have given disappointed Trick or Treaters the option to trade in their less than desired Halloween spoils with their very own Candy Converter. 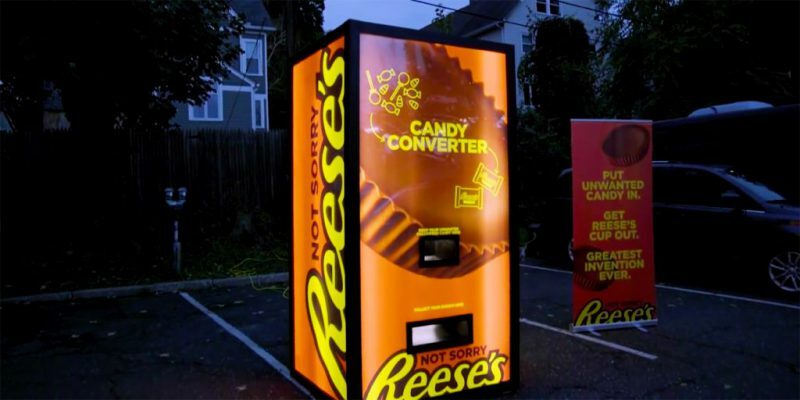 The vending machine-like contraption will swap unwanted sweets from bargain store-brand lollipops to hard boiled sweets and pay out with the brand’s famous Reece’s Cup instead.